Surrounded by Fairy Lake the park has something for everyone. 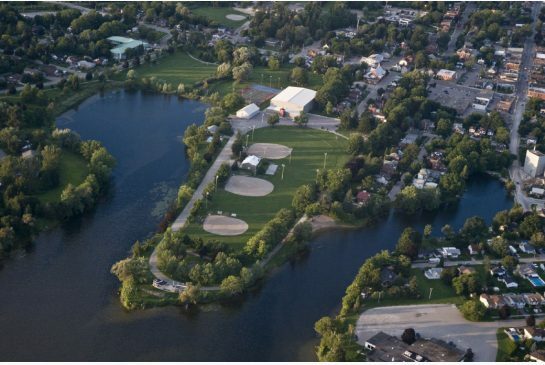 The Dufferin Rural Heritage Community Centre calls the park home in addition to baseball diamonds, tennis and multi-purpose courts, the Rotary Club Bandstand, a Picnic Pavillion, Leash free dog park, track, soccer field, play ground and the Superior Glove Splash Pad. During the summer you can enjoy a variety of activities including Yoga in the park, Movies in the Park and Canada Day Fireworks. The Acton Agricultural Society also hosts their annual Fall Fair here. This park has lots of parking and is behind the Acton Arena. There is a skate park featuring some cool obstacles including a quarter to curved quarter launch to grind, small vert quarter and a perfect long table top ledge. The park is popular with skateboarders, bmx riders, roller bladers and people riding free style scooters. In addition to the skate park there is also a children’s play ground, walking trails and several sports fields. 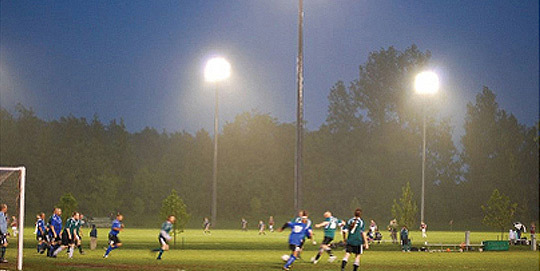 The sports fields are well lit for evening games.